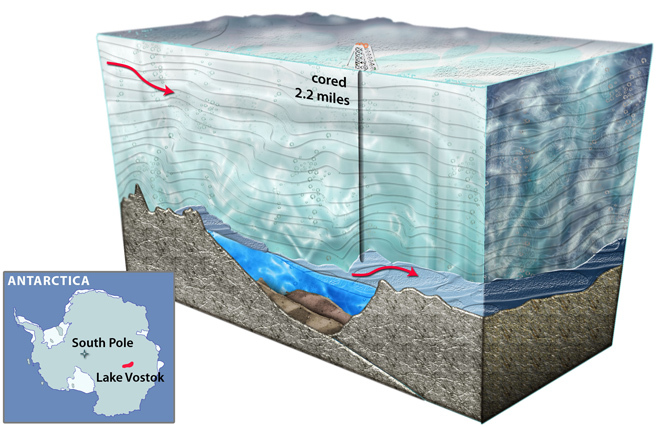 LAKE VOSTOK is more than 1,000 feet deep with a surface area equal to Lake Ontario. GENEVA — A defecting Russian scientist has surfaced with a mind-bending account of what REALLY occurred when he and his colleagues went missing for five days in a mysterious lake 12,366 feet beneath the Antarctic ice. Dr. Anton Padalka told authorities in Switzerland that the researchers discovered a bizarre and deadly life form dubbed Organism 46-B – a highly intelligent octopus-like creature that claimed the lives of three of the team members. But the government of Russian president Vladimir Putin claimed that “nothing of scientific interest” was found – because the former KGB strongman hopes to weaponize the organism. “The discovery of such unusual life in Lake Vostok was the most important scientific breakthrough in decades, but we were ordered not to divulge it because of Mr. Putin’s sinister scheme,” the whistleblowing geologist told the Swiss. It was in early February 2012 that members of the Russian Antarctic Expedition succeeded in the drilling through more than two miles of thick ice to Lake Vostok – a project that took more than 30 years. Because the freshwater lake has been sealed off from the rest of the world for between 15 and 34 million years, scientists had predicted they would find new species that had evolved far differently than any seen before. “According to our research, the quantity of oxygen there exceeds that on other parts of our planet by 10 to 20 times. Any life forms that we find are likely to be unique on Earth,” Sergey Bulat, the project’s Chief Scientist said on Russian TV as the geologists were drilling down. Previously, extremely weird creatures had been found in deep-sea vents off the coast of Antarctica including hairy-chested yeti crabs that feed on gardens of bacteria they cultivate on their bodies and carnivorous, seven-armed sea stars that can catch and kill those crabs. Just as the eight man team neared the lake all communication with the outside world mysteriously ceased. As days crept by and the researchers failed to respond to increasing frantic efforts to reach them by radio, fellow scientists worldwide feared the worst. Or maybe he couldn’t. Dr Padalka claims that during this time, he and his colleagues were fighting for their lives in the lost world deep beneath the earth’s surface. 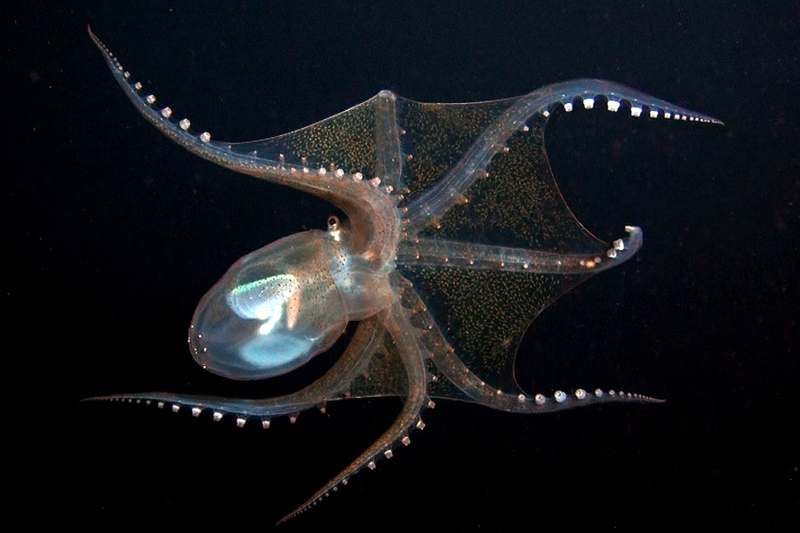 Octopuses like this vitrelladonella richardi are known for extreme intelligence. Although the creature has 14 arms instead of the usual eight, it kills in a similar manner to an ordinary octopus — seizing its prey, injecting it with paralyzing saliva then dismembering it into small pieces with its beak. But Organism 46-B has another trick up its sleeve. The 33-foot-long man-eater also boasts extraordinary camouflage that helped it stalk the researchers. But the shape-shifting abilities of Organism 46-B sound almost diabolical. If an arm of an ordinary octopus is cut off, the severed limb will crawl away – sometimes even seize prey and place it in the mouth of the octopus. Experts say that’s because each arm contains a cluster of neurons – essentially its own brain. The arms of Organism 46-B demonstrated a chilling knack for operating autonomously. The experts believe that not only does the octopus regenerate its limbs, the brainy severed tentacle may be able to form a new octopus. Octopuses are extraordinarily intelligent, able to negotiate mazes, use tools and even build structures with Legos. The newly discovered entity is in a class by itself. Miraculously, the eggheads were able to capture the creature in a tank. After the five surviving scientists made their way to the surface, the program’s director ordered that the bore hole be immediately plugged. The geologists expected to be honored internationally for their amazing find. To their great disappointment, however, the Russian government claimed that the team had found no life in Lake Vostok – and denied that divers had even entered the water. U.S. and British experts were puzzled by the announcement. 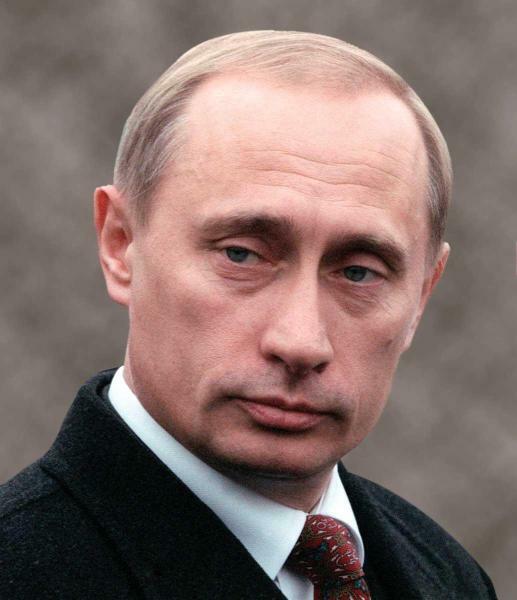 COLD AS ICE: Russian President Putin is known for ruthlessness and secrecy. Dr. Padalka claims he fled his native country in July after learning to his horror that the government is planning to put the discovery to military use. The Russian government calls the whistleblower’s claims preposterous. If you enjoy reading fact and fiction woven artfully together check out new the thriller Houdini vs. Rasputin, written by the author of this article. If you enjoyed this mind-bending article by C. Michael Forsyth check out his collection of bizarre news stories, available on Kindle and in other eBook formats. The uh, the earth has a diameter of 4000 miles. Maybe, uh… Maybe adjust the statistics for Lake Vostok? Very similar to a sci fi movie of the 1950s, about dinosaurs surviving in a tropical oasis in Antarctica. Did they explain what this huge monster would eat in a lake under so much ice and no light? implausible as written – wet suits at the bottom of a two mile deep hole?! In freexing water? Of course they would never use a wet suit for such a project without sealing/taping it which would have prevented the venom from having effect. For such a thing dry suits or more likely a submersible would be used. And how did the animal intentionally cut off their comm before they even got in the water? 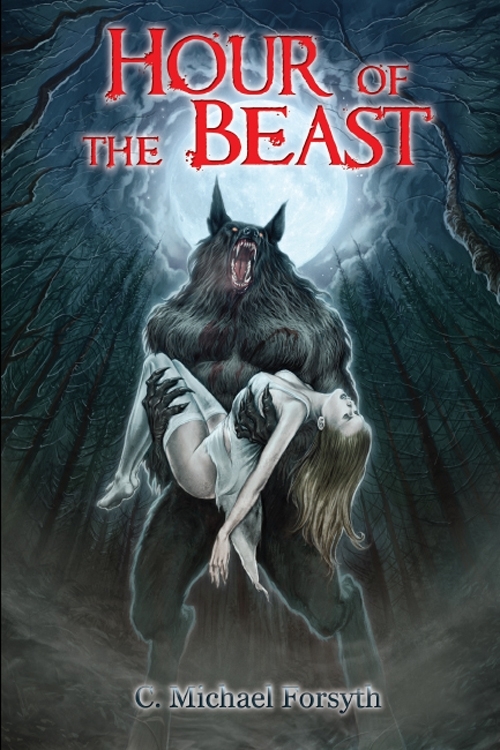 I love it, and it could have come from the pages of my book – Beneath the Dark Ice. Thank you for sharing! Obviously fiction, a good premise for an upcoming science fiction movie. Pingback: The Real Truth About Putin’s Killer Squids | Thar She Blows!